This audio recording device for DJs has now an integrated lithium-ion battery that allows you to record your mix in WAV or MP3 format directly to a microSD card in a sleek retro tape design. Line-level or mic sources, such as CD players, DJ mixers or dynamic mics can be directly connected to TAPE 2 via the 3.5 mm jack input. With the included stickers it is also possible to customise the look of your TAPE 2. Considering purchasing the Reloop Tape 2 Recording device for DJs? Have questions? Ask people who've recently bought one. Do you own the Reloop Tape 2 Recording device for DJs? Why not write a review based on your experience with it. 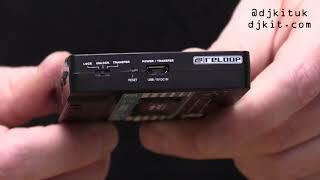 Seen a video for Reloop Tape 2 Recording device for DJs online or have you own video? Check out Reloop Tape 2 Recording device for DJs on DJkit.com!